The Solution 1.3 is Enerzone’s smallest wood burning stove. 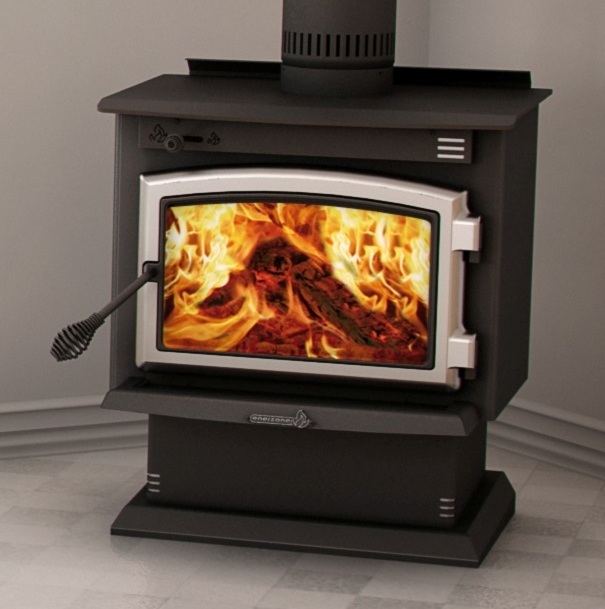 This compact yet powerful wood stove is extremely effective at heating small areas, making it a great addition to a family room, bedroom, or basement. The Solution 1.3 features 40,000 BTU/hr heat output and can be combined with a 130 CFM blower to maximize heat transfer to heat 250 to 1,000 square feet of space. The firebox is 1.3 cubic feet and holds logs up to 17 inches. This wood burning stove also has a self-cleaning glass system, optimum efficiency of 78.2%, and can be personalized by adding a pedestal or legs. The Solution 1.3 is available with black, brushed nickle plated, or gold plated door finish.